An aspheric lens or asphere is a lens whose surface profiles are not portions of a sphere or cylinder. In photography, a lens assembly that includes an aspheric element is often called an aspherical lens. The asphere's more complex surface profile can reduce or eliminate spherical aberration and also reduce other optical aberrations such as astigmatism, compared to a simple lens. A single aspheric lens can often replace a much more complex multi-lens system. The resulting device is smaller and lighter, and sometimes cheaper than the multi-lens design. Aspheric elements are used in the design of multi-element wide-angle and fast normal lenses to reduce aberrations. They are also used in combination with reflective elements (catadioptric systems) such as the aspherical Schmidt corrector plate used in the Schmidt cameras and the Schmidt-Cassegrain telescopes. Small molded aspheres are often used for collimating diode lasers. Aspheric lenses are also sometimes used for eyeglasses. Aspheric eyeglass lenses allow for crisper vision than standard "best form" lenses, mostly when looking in other directions than the lens optical center. Moreover, the reduction of the magnification effect of a lens may help with prescriptions that have different powers in the 2 eyes (anisometropia). Not related to the optical quality, they may give a thinner lens, and also distort the viewer's eyes less as seen by other people, producing better aesthetic appearance. where the optic axis is presumed to lie in the z direction, and is the sag—the z-component of the displacement of the surface from the vertex, at distance from the axis. The coefficients describe the deviation of the surface from the axially symmetric quadric surface specified by and . Unfortunately, the above equation suffers among others from strong correlation between the coefficients of the first term and the polynomial terms. This leads to strong divergences when it comes to fitting the equation to an aspheric surface. Therefore, different equations using "Q-polynomials" where coefficients are orthogonal to each other are an alternative that is sometimes used. Small glass or plastic aspheric lenses can be made by molding, which allows cheap mass production. Due to their low cost and good performance, molded aspheres are commonly used in inexpensive consumer cameras, camera phones, and CD players. They are also commonly used for laser diode collimation, and for coupling light into and out of optical fibers. Larger aspheres are made by grinding and polishing. Lenses produced by these techniques are used in telescopes, projection TVs, missile guidance systems, and scientific research instruments. They can be made by point-contact contouring to roughly the right form which is then polished to its final shape. In other designs, such as the Schmidt systems, the aspheric corrector plate can be made by using a vacuum to distort an optically parallel plate into a curve which is then polished "flat" on one side. Aspheric surfaces can also be made by polishing with a small tool with a compliant surface that conforms to the optic, although precise control of the surface form and quality is difficult, and the results may change as the tool wears. Single-point diamond turning is an alternate process, in which a computer-controlled lathe uses a diamond tip to directly cut the desired profile into a piece of glass or another optical material. Diamond turning is slow and has limitations in the materials on which it can be used, and the surface accuracy and smoothness that can be achieved. It is particularly useful for infrared optics. Several "finishing" methods can be used to improve the precision and surface quality of the polished surface. These include ion-beam finishing, abrasive water jets, and magnetorheological finishing, in which a magnetically guided fluid jet is used to remove material from the surface. Another method for producing aspheric lenses is by depositing optical resin onto a spherical lens to form a composite lens of aspherical shape. Plasma ablation has also been proposed. 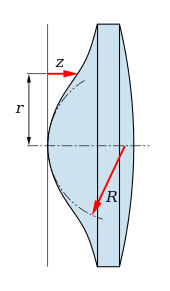 The non-spherical curvature of an aspheric lens can also be created by blending from a spherical into an aspherical curvature by grinding the curvatures off-axis. Dual rotating axis grinding can be used for high index glass that isn't easily spin molded, as the CR-39 resin lens is. Techniques such as laser ablation can also be used to modify the curvature of a lens, but the polish quality of the resulting surfaces is not as good as those achieved with lapidary techniques. Standards for the dispensing of prescription eyeglass lenses discourage the use of curvatures that deviate from definite focal lengths. Multiple focal lengths are accepted in the form of bifocals, trifocals, vari-focals, and cylindrical components for astigmatism. Concave aspheres fitted in a spectacle frame. The lenses' "minus" powers minify the test pattern and bring it into better focus at the center of the lenses. Reflections from the non-aspheric anterior surfaces are also visible. Like other lenses for vision correction, aspheric lenses can be categorized as convex or concave. Convex aspheric curvatures are used in many presbyopic vari-focal lenses to increase the optical power over part of the lens, aiding in near-pointed tasks such as reading. The reading portion is an aspheric "progressive add". Also, in aphakia or extreme hyperopia, high plus power aspheric lenses can be prescribed, but this practice is becoming obsolete, replaced by surgical implants of intra-ocular lenses. Many convex types of lens have been approved by governing agencies regulating prescriptions. Concave aspheres are used for the correction of high myopia. They are not commercially available from optical dispensaries, but rather must be specially ordered with instructions from the fitting practitioner, much like how a prosthetic is customized for an individual. The range of lens powers available to dispensing opticians for filling prescriptions, even in an aspheric form, is limited practically by the size of the image formed on the retina. High minus lenses cause an image so small that shape and form aren't discernible, generally at about -15 diopters, while high plus lenses cause a tunnel of imagery so large that objects appear to pop in and out of a reduced field of view, generally at about +15 diopters. In prescriptions for both farsightedness and nearsightedness, the lens curve flattens toward the edge of the glass, except for progressive reading adds for presbyopia, where seamless vari-focal portions change toward a progressively more plus diopter. High minus aspheres for myopes do not necessarily need progressive add portions, because the design of the lens curvature already progresses toward a less-minus/more-plus dioptric power from the center of the lens to the edge. High plus aspheres for hyperopes progress toward less-plus at the periphery. The aspheric curvature on high plus lenses are ground on the anterior side of the lens, whereas the aspheric curvature of high minus lenses are ground onto the posterior side of the lens. Progressive add reading portions for plus lenses are also ground onto the anterior surface of the lens. The blended curvature of aspheres reduces scotoma, a ringed blind spot. Aspheric elements are often used in camera lenses. This is often indicated by the abbreviation ASPH in the names of such products. In 984, Ibn Sahl first discovered the law of refraction, usually called Snell's law, which he used to work out the shapes of anaclastic lenses that focus light with no geometric aberrations. Early attempts at making aspheric lenses to correct spherical aberration were made by René Descartes in the 1620s, and by Christiaan Huygens in the 1670s; the cross-section of the shape devised by Descartes for this purpose is known as a Cartesian oval. The Visby lenses found in Viking treasures on the island of Gotland dating from the 10th or 11th century are also aspheric, but exhibit a wide variety of image qualities, ranging from similar to modern aspherics in one case to worse than spheric lenses in others. The origin of the lenses is unknown, as is their purpose (they may have been made as jewelry rather than for imaging). Francis Smethwick ground the first high-quality aspheric lenses and presented them to the Royal Society on February 27, 1667/8. A telescope containing three aspheric elements was judged by those present "to exceed [a common, but very good telescope] in goodness, by taking in a greater Angle and representing the Objects more exactly in their respective proportions, and enduring a greater Aperture, free from Colours." Aspheric reading and burning glasses also outdid their spherical equivalents. Moritz von Rohr is usually credited with the design of the first aspheric lenses for eyeglasses. He invented the eyeglass lens designs that became the Zeiss Punktal lenses. The world's first commercial, mass-produced aspheric lens element was manufactured by Elgeet for use in the Golden Navitar 12 mm f/1.2 normal lens for use on 16 mm movie cameras in 1956. (See Image sensor format.) This lens received a great deal of industry acclaim during its day. 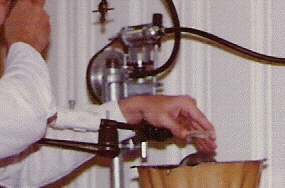 The aspheric elements were created by the use of a membrane polishing technique. The optical quality of a lens system can be tested in an optics or physics laboratory using bench apertures, optic tubes, lenses, and a source. Refractive and reflective optical properties can be tabulated as a function of wavelength, to approximate system performances; tolerances and errors can also be evaluated. In addition to focal integrity, aspheric lens systems can be tested for aberrations before being deployed. The use of interferometers has become a standard method of testing optical surfaces. Typical interferometer testing is done for flat and spherical optical elements. The use of a null corrector in the test can remove the aspheric component of the surface and allow testing using a flat or spherical reference. 1 2 "What do "aspheric" or "aspherical" mean?". Fuzhou Looklens Optics. Retrieved June 15, 2012. ↑ Meister, Darryl. "Ophthalmic Lens Design". OptiCampus.com. ↑ Pruss, Christof; et al. (April 2008). "Testing aspheres". Optics & Photonics News. 19 (4): 26. Bibcode:2008OptPN..19...24P. doi:10.1364/OPN.19.4.000024. ↑ Forbes, Greg (2007). "Shape specification for axially symmetric optical surfaces". Opt. Express. 15 (8): 5218–5226. Bibcode:2007OExpr..15.5218F. doi:10.1364/oe.15.005218. 1 2 3 Shorey, Aric B.; Golini, Don; Kordonski, William (October 2007). "Surface finishing of complex optics". Optics and Photonics News. Optical Society of America. 18 (10): 14–16. ↑ Jalie, Mo (2003). Ophthalmic Lenses and Dispensing. Elsevier Health Sciences. p. 178. ISBN 0-7506-5526-7. ↑ Wolf, K. B. (1995). "Geometry and dynamics in refracting systems". European Journal of Physics. 16: 14–20. Bibcode:1995EJPh...16...14W. doi:10.1088/0143-0807/16/1/003. ↑ Rashed, R. (1990). "A pioneer in anaclastics: Ibn Sahl on burning mirrors and lenses". Isis. 81: 464–491. doi:10.1086/355456. 1 2 Schmidt, Olaf; Karl-Heinz Wilms; Bernd Lingelbach (September 1999). "The Visby Lenses". Optometry & Vision Science. 76 (9): 624–630. doi:10.1097/00006324-199909000-00019.